The R&S®SMW-K75 option extends the functionality of the R&S®SMW-K74 MIMO fading/routing option by adding 2x4x2, 2x2x4, 2x4x4 as well as 4x8 and 8x4 MIMO scenarios. Digital standards such as LTE-Advanced and WLAN use MIMO technology to achieve ambitious throughput goals. The R&S®SMW200A is ideal for these MIMO scenarios. Its powerful channel emulator can simulate even complex MIMO fading scenarios. The functionality is used to simulate single carriers with higher order MIMO such as 4x8 or 8x4, for example. 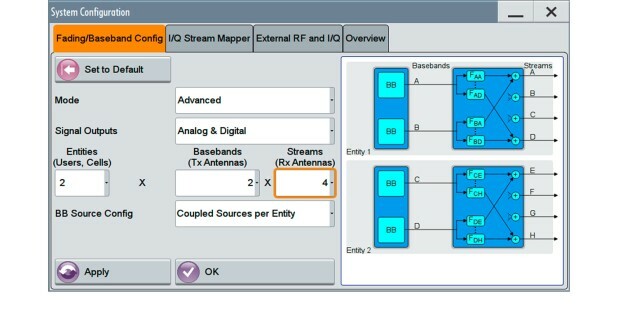 Furthermore it is used to simulate carrier aggregation or multi-cell scenarios with 4x2, 2x4 or 4x4 MIMO per individual carrier or cell. Correlation Correlation between corresponding fading paths of all TX/RX signal paths can be set in a correlation matrix. For each fading path index, an individual matrix can be set.